The Panasonic Lumix DMC-GF5 juggles sophistication with simplicity, updating last year's interchangeable lens GF3. Can it tempt point-and-shoot photographers to invest in a new system? Looking for a way to improve your photo taking beyond merely pointing and shooting with that smartphone or pocket cam? Easing us gently into the world of interchangeable lens cameras with physically larger sensors – both features promoting better image quality – is the Panasonic Lumix DMC-GF5. Updating last year's Panasonic Lumix DMC-GF3 as the new entry level camera in the Lumix G range, the GF5 with its soft edges and sleek unthreatening curves appears perfectly pitched at anyone looking to make the step up. Like its predecessor, it features a 12 megapixel Micro Four Thirds format sensor, and has maintained an auto focus time of 0.9 seconds which its manufacturer is still claiming as the world's fastest. New this time around however is a Venus Engine 7HD processor, a re-vamped more visual-led user interface plus subtly curved handgrip, maximum ISO12800 light sensitivity that puts it on a par with mid range digital SLRs, plus Full HD 1920x1080 pixels video clips with stereo sound. Price wise, there are a couple of kit options with the GF5; on launch in June Panasonic is expecting street prices are going to be around £579 with the 14-42mm 'X' series power zoom lens provided with our review sample, the smooth and impressively quiet mechanical operation of which is controlled via a switch, or £449 with the regular 14-42mm zoom, manually adjusted with a twist of the photographer's wrist. Both lenses provide a 35mm equivalent focal range of 28-84mm. Once you've bought the camera, there are currently around 16 compatible lenses from Panasonic to choose from. Direct competitors in the Compact System Camera (CSC) market include the Olympus E-PM1 and Nikon 1 J1 cameras. So can the new Panasonic, available in serious black or stylish white, hold its own? 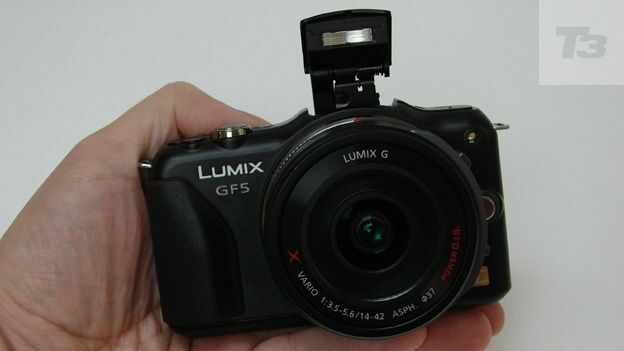 The GF5 may be the entry model in the Lumix G range, but with an aluminium chassis and metal buttons it doesn't feel cheap. Like its predecessor, controls are divided between top plate and backplate buttons, with virtual versions provided on the touch screen. There is no physical shooting mode wheel provided for example, as these functions have navigated to a virtual dial on the rear LCD, summoned up with a press of 'menu/set'. Handily, a dedicated button for shooting video sits next to it. The default setting of intelligent Auto also gets its own button, so there's the option to press this and point and shoot to your heart's content, the GF5 choosing optimum settings based on subject for you. In practice we found use of the GF5 quickly became intuitive and, rather than confusing, the division of operation between screen and physical buttons mostly acted as a time saver. The other 'control' here is provided on the lens itself, courtesy of the 'X' power zoom provided with our review kit. For those wanting a camera and lens combo with a slim profile, this is the one to go for. It has a shallower physical depth than the cheaper manual-use 14-42mm, and provides a switch for toggling between wide and telephoto settings, as you'd find on a regular pocket camera. However we did slightly miss the ability to manually adjust the zoom, which can make for more precise framing. Though admittedly the smooth action of this 'X' lens has the edge if video work is your aim. The Panasonic Lumix DMC-GF5 features a 3-inch 920k-dot resolution LCD. It's fixed, in that it cannot be tilted or angled to achieve those otherwise awkward low or high angle shots, but again this helps maintain a slim profile. Doubtless for the same reason but also because in their place is where a pop-up flash now sits, there's no hotshoe or accessory port to attach a supplementary electronic or optical viewfinder either, as found on the pricier flagship Panasonic GX1. We are in effect 'stuck' with the one LCD on the GF5, not that this will be a deal breaker for anyone stepping up from a compact camera or smartphone who will be used to composing and reviewing shots via the single screen anyway. Though 3 inches is usually big enough for a camera screen, we found ourselves wishing for another half inch, especially when faced with smaller touch sensitive buttons, such as those controlling the crucial likes of ISO sensitivity. However, the fact that this is a touch screen avoids the need to tab through a long toolbar of settings to select the one required. You simply see what you want, give that setting a tap, and the job's done. The Panasonic Lumix DMC-GF5 is supplied with a DMW-BLE9E rechargeable lithium ion battery. This is good for up to 330 shots from a full charge, which is standard stuff for an entry-level CSC. In fact the performance matches that of the Olympus E-PM1 (330 snaps), while bettering the Nikon J1 (a paltry 230 pics). The GF5's battery shares a compartment at the camera's base with a slot for inserting all varieties of SD media card: an optional yet essential extra. With the ability to shoot stills in uncompressed Raw file format as well as standard compressed JPEG files, while this may be a camera pitched at consumers, were an enthusiast to pick it up it wouldn't feel like a complete toy. Add to this program, aperture priority, shutter priority and manual modes, plus a custom setting and 23 pre-optimised scene modes majoring on the commonest subjects of portraits and landscapes. These are ably illustrated with large photos by way of explanation as to the outcome of each option. We also enjoyed the on-board array of effects filters to be found by delving into Creative Control mode. These include the now ubiquitous building-shrinking 'miniature' effect, and the ability to isolate a single 'spot' colour within an image. Of course with intelligent Auto mode one can just point and shoot and get excellent results – so much so that it's tempting to do just that and not bother with the rest as described. At the end of the day though the performance, despite being colour rich and sharp for both video and stills when there's plenty of light around, on occasion betrays the fact that this camera sits between your humble snapshot and a better quality digital SLR that one could buy for the same price. It's better than one, but not as good as the other – which in fairness sums up most Compact System Cameras. For most casual photographers wanting something they can sling in their jacket pocket or bag for results a bit better than the norm, the GF5 will more than do though, and the effects filters, if used in moderation, can be quite striking. Panasonic has largely taken the 'if it ain't broke don't fix it' stance with the 12.1 megapixel GF5. Admittedly, since the brand is reportedly number one in the Compact System Camera (CSC) market, perhaps it was unwise to tinker too much with the GF3's successor. While that doesn't make for an especially exciting camera to review, and there is really no need for existing owners to stick their present model on eBay, there is still much here for new converts to love – chiefly the fact that this is currently the easiest CSC to use. Unless you're struggling in reduced light, picture quality is reliably consistent from shot to shot, so getting sharp and vibrantly colourful results really is just as easy as pointing and shooting. f you're bored of that snapshot camera, here is an easier means than a DSLR of upping your game and developing that photographic skill set.